To start off the review lets take at look at the specs for each tablet. * 8.9-inch version also available with a 1,920×1,200-pixel resolution. 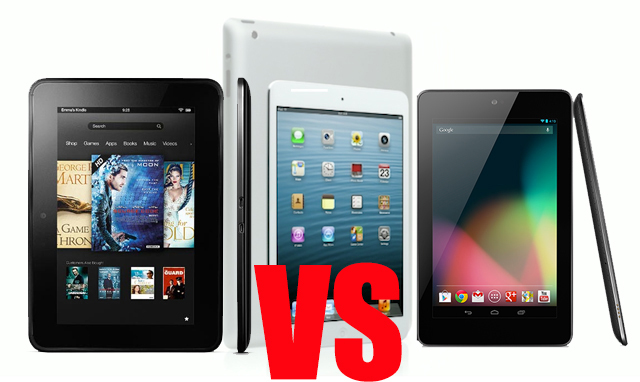 When you line up the specs and the intangibles, which tablet has the upper hand: the iPad Mini, the Asus-made Google Nexus 7 (an original Android 4.1 Jelly Bean device), or the Amazon Kindle Fire HD? Nexus 7: With quad-core Tegra 3 processor, it delivers fast performance and a beautiful and responsive screen. Also, it’s comfortable to hold and Android 4.1 brings a surplus of welcome additions. At only $200, the Nexus 7 is a steal. With a beautiful screen, fast performance, a comfortable design, and overall great media options, the Nexus 7 is easily the best 7-inch tablet available and one of the top tablets on the market. I-Pad Mini: It’s lighter and thinner than the competition, but the screen resolution lacks Apple’s crystal clarity, and the iPad Mini’s A5 dual-core processor could easily fall to the Nexus 7’s quad-core CPU. What’s more, the battery life is on par with rivals. The fourth-gen iPad is otherwise identical to its recent predecessor — same size, weight, and Retina screen. It’s heavy to hold in one hand, and most older accessories won’t work without investing in a pricey Lightning adapter. Amazon Kindle Fire HD: It has a most impressive-looking 7-inch tablet screen, its speakers deliver killer sound, and its refined interface is the best gateway to Amazon content for Prime members. New enhancements fill its $200 price to the brim with value. Performance is sluggish at times and the Fire HD is less comfortable to hold than the Nexus 7. The curated app store means many apps and games are not available. There’s a $15 opt-out for ads. The Kindle Fire HD is the Kindle Fire as it should of been.